When I'm not playing Drop7 on my subway rides through New York City, I am trying to burrow ever deeper into my second-favorite iPhone game, Bejeweled—specifically that game's Diamond Mine mode which challenges me to match gems in order to dig ever deeper down into the dirt at the bottom of my screen, as I race against a timer. The next game from Zynga, the massive game-maker/studio-acquirer behind FarmVille and Words with Friends will soon have their own riff on Diamond Mine on Facebook and Zynga.com. Their version is called Ruby Blast. Ruby Blast uses the same basic idea as Diamond Mine, such is the way that so many new so-called casual or social games tweak or evolve each other's systems (cynics call this cloning; glass-half-full people call this iterating). You will be matching clusters of similarly colored gems in Ruby Blast while digging ever deeper and racing against a timer. The novel twists: 1) you're connected to a friends' leaderboard; 2) you can unearth drills that bear the faces of your friends and will clear rows for you, incentivizing you to have more friends playing; and 3) you can bring several power-ups into each round of the game and then have to strategically fill their power meters as you color-match in order to unleash them and destroy rows of columns of gems. "Match-3 games have been around as a category for more than 20 years," the game's lead designer, Jonathan Grant, told me yesterday during a hands-off demo of the game. "We recognize that there are a lot of Match-3 games there. What we wanted to do was take a familiar concept and innovate in a way on top of it but add new twist for players." The most unexpected thing about Zynga's push for this game is that they're promoting the graphics. Grant said he wanted the game to be "visually spectacular," which is not something the Zynga folks tend to talk about. He says the game is Zynga's first to use Stage 3D technology from Flash 11, which gives them the ability to generate more particle effects. That's their way of explaining that explosions of starbursts will be more sparkly and kinetic than you'd usually see from this kind of thing. "We wanted to make one of the most visually-spectacular game in the Zynga catalog and also on Facebook," he said. 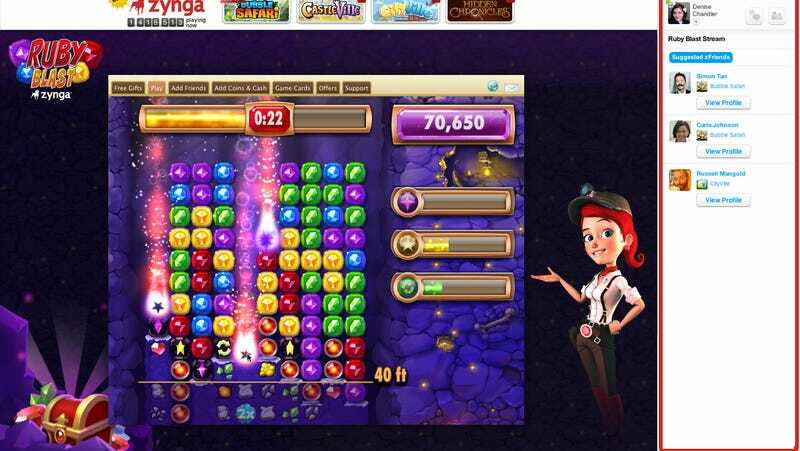 Ruby Blast is made by Grant's team in Zynga Seattle as well as developers in Zynga China. It'll go live for free some time this week through this link. Zynga is also working on a version of the game that will feature simultaneous multiplayer—Puzzle Fighter-style, presumably—for later this year.